Connectedness is approaching the end of its ten-day reign on the "Blogs of Note" list. It's been fun getting all the extra traffic and comments from newcomers to the world of social network analysis. Anybody wondering what I am talking about may appreciate jumping to this welcome post. I have kept a close eye on my traffic since 06-06-06, and the statistics are dramatic. The chart below shows how the blogger.com home page went from nowhere to being 95% of my traffic overnight. 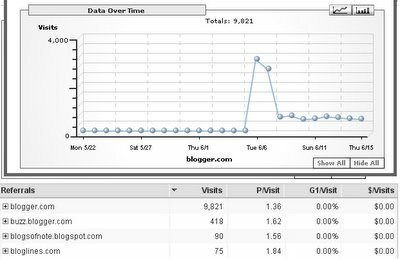 The thing that has really puzzled me about the above chart is how being at the top of the ten blogs of note (as Connectedness was for 24 hours starting 9am PDT Tue 6/6, and as Farmgirl Fare is right now) is so different from being anywhere else on the list. Are web surfers so mindless that we nearly always click on the top of the list, no matter what appears below it? Moral of the story: It's easy to jump to the wrong conclusions from a network analysis if you forget that we (even websites) personalize the referrals that we share depending on who is asking. It seems people do tend to click the first site the most. I am the only one here it seems from the homepage. how do you get those cool stats about your site? I found the list of blogs of note from my dashboard and went through each and ever blogs listed. Well I wasn't too mindless, I found you roughly half way down the list of blogs of note. Mind if I pass you blog on to a few colleagues? I wish there was an easier way to find (browse) through blogs. . . The "blogs of note" is admittedly a mindless way of connecting. 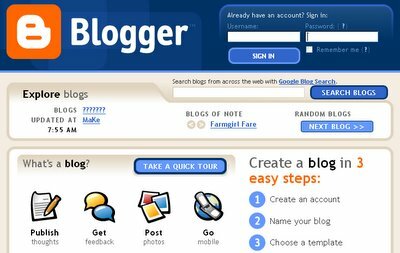 99% of the losers who check out blogs of note do it everyday to leave half hearted complements and responces about how "cool" the persons blog is in hopes that someone will click on their name and go to their blog. So after the first day or so 99% of the people who check out blogs of note already left a stupid post on one of your threads and don't bother coming back even though they told you how great your blog was. I mean, that is what I am doing. This sentence expresses my weakness for self-referential writing. I wish they had a way of pin pointing users .. like where are they coming from instead of just the country info.